The Burka Band......is the first female popband from Afghanistan ever! In october 2002 Kurt Dahlke, Frank Fenstermacher and Saskia Klitzing (atatak/Fehlfarben/Der Plan) were invited with "a certain frank" to do a music-workshop in Kabul, in order to exchange their experience as musicians. In this context Saskia was giving courses in drumming and a young Afghan woman was so excited by the idea of performing that she decided to become a drummer herself. 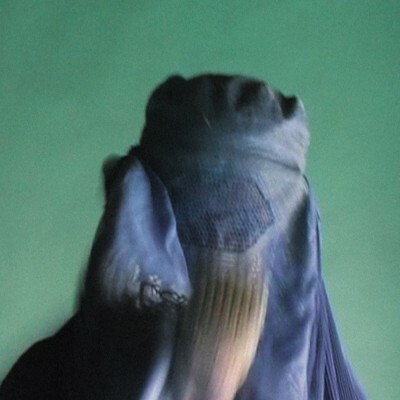 The beat on "burka blue" is the product of that decision; the drumkit was kept hidden from the Taliban regime for over six years and the recordings have been made on a cassette recorder in the Goethe-Institute's kitchen and other "safe" public spaces in Afghanistan. But despite its coming from a world that until today was mostly presented to us as martial and misanthropic, "burka blue" strikingly manages to be an ultimatively joyful song and the highly self-ironic answer to western superstars and girliegroups.Get on yer camels now, it'll be a long journey:..." my mother wears blue jeans now and i am so surprised.. the things are changing faster i don`t know, if it`s right"..On the B-Side of the 7" you'll find a wonderful Remix from Barbara Morgenstern, which could be another A-side.